Luton Hoo: A Taste of English Royalty — Now That's a Honeymoon! I know very little of Luton. And by saying that I mean I know about Luton Airport. So when Dexter mentioned we will be spending a night at Luton Hoo, I simply asked: Luton What? After a bit of reading from their website and visiting a couple of hotel reviews, I felt embarrassed not knowing about Luton Hoo. This embarrassment quickly turned into anticipation knowing we’ll be spending a weekend there. And if there was one word I learned from my online research about Luton Hoo, it would most certainly be: ROYAL. STAY AT LUTON HOO: CHECK ROOM AVAILABILITY HERE! Located in Bedfordshire, this Grade I-listed stately mansion house and now five-star luxury countryside hotel dates from the late 18th century. Once owned by diamond magnate Sir Julius Wernher, Luton Hoo has been graced by a visit from Sir Winston Churchill and previously honeymoon destination to Queen Elizabeth II and Prince Phillip! Yes, the Queen spent a part of their honeymoon here and several wedding anniversaries. Cue: Now that’s a honeymoon. With so much history surrounding Luton Hoo, it’s no surprise that it has been a famous location to over a dozen movies including two James Bond films, Four Weddings and a Funeral, The Importance of Being Earnest, and Enigma, to name a few. Luton Hoo boasts a total of 228 bedrooms and suites. The Mansion House was our home for one night, a romantic getaway, a luxuriously sweet and elegant honeymoon. The drive to the mansion was nothing short of spectacular. Classic London black cabs were lined up at the Mansion House front, ready to ferry guests to the Country Club which was only a 5-minute walk away. A gentleman in a grey suit and top hat could not be missed, as he removed a ‘Reserved’ sign from a corner and signaled us to park. We knew from then we were in for a treat. True enough, the lobby was grandiose. Although the Reception was quite underwhelming, the adjoining rooms on the ground floor were lavishly designed in an Edwardian belle époque style: patterned rugs, high ceilings matching the heavy curtains, tall chandeliers, the scent of woodsmoke from an ornate fireplace where guests have gathered in plush chairs. It was opulent but not intimidating. There were couples, families with children (well behaved, I must say), businessmen doing business as usual, and a few ladies enjoying a bachelorette. The guests were a mix of those doing business and pleasure, our choice of stay being the latter. Situated on the second floor, our Mansion Master Room features a king bed, a sitting area, and a study. The room had access to the mansion’s centre balcony overlooking a breathtaking Capability Brown-landscape of 1,065 acres. The marble bathroom features a whirlpool bath (YES! ), his and hers sinks, and a separate shower room. Its Edwardian style and gold fittings keep up with the mansion’s ornate decor. Hair care and body products are by Molton Brown. Also available in the room are a Nespresso machine, complimentary bottles of water, a TV unit, a fitted wardrobe, a safe box, and ironically two stand fans. The luxurious feel of gold-framed mirrors, floral prints, and curtains with tassel tiebacks transformed into romantic when we were served chocolate-dipped strawberries and a chilled bottle of Canard-Duchêne as we entered the room! If you’re looking for a place to spend your honeymoon or wedding anniversary, Luton Hoo offers a Romantic Break where your stay is inclusive of traditional English breakfast, full use of spa and leisure facilities, discount on spa treatments, and you can customise your honeymoon treat! The rest of our afternoon was spent at the Country Club. The leisure and spa facilities at the renovated stable include a gym, an indoor swimming pool, steam rooms, and spa treatment rooms. The gym, albeit small, had basic equipment such as treadmills, exercise bikes, and rowing machines. Photo courtesy of Luton Hoo Hotel, Golf & Spa. It’s also worth spending time to explore the mansion grounds - don’t forget that Luton Hoo covers over a thousand acres of gardens and meadowland! Capability Brown, “England’s greatest gardener” and designer to over 170 parks in England, landscaped Luton Hoo’s gardens. Never having to leave the hotel to have a decent meal is simply comforting. There are a few options at Luton Hoo whether you’re looking for casual dining, a fancy 2AA Rosette restaurant, or if you simply need a drink and some music. Offering a relaxed ambiance, stills from movies that were filmed in Luton Hoo decorated the restaurant’s walls. The wooden furniture, leather booths, crimson carpet and high ceilings provide a casual dining space. Bread and butter were served as soon as we were sat to our table. The main courses do not come with sides so our waitress excitedly recommended the mashed potatoes (not on the menu) and it was surprisingly delicious. Dexter’s pork belly was more to my liking than my venison shoulder so I ended up picking from his plate the rest of the evening. Compliments of Luton Hoo is a special dessert plate with Happy Honeymoon sprawled in chocolate sauce! A happy honeymoon, indeed! 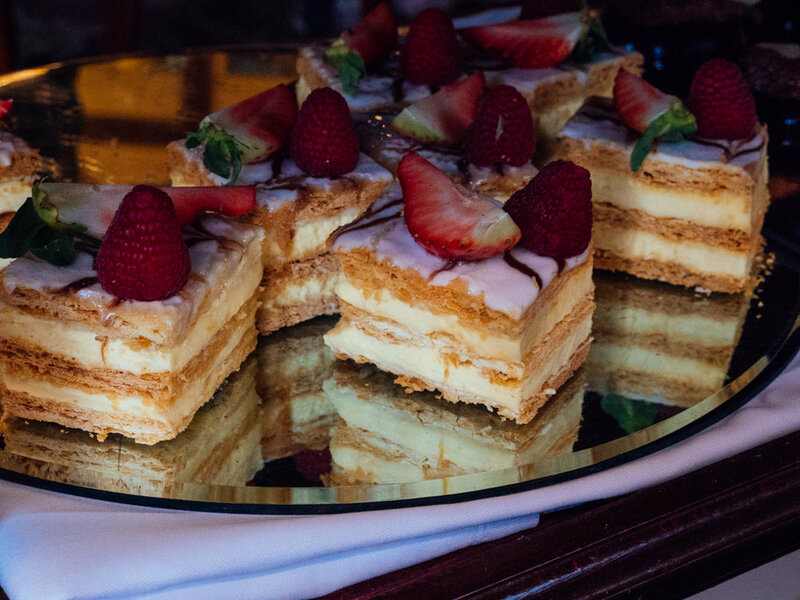 Named after Sir Julius Wernher who bought Luton Hoo in 1903, 2AA Rosette Wernher Restaurant offers British cuisine and a fine dining experience. I don’t remember eating at a restaurant this magnificent nor would I normally use the word magnificent to describe a restaurant. Wernher Restaurant reminded us of Versailles’ extravagance with its elaborate style: tall windows overlooking a green meadow, glass chandeliers, massive tapestries (that stood as background for fruit juices and croissants during breakfast), and marble pillars on every corner. It was beautiful and excessive, elegant and extravagant, yet we had breakfast at Wernher Restaurant… in gym clothes. The breakfast menu was quintessentially British, apart from traditional English breakfast there was also grilled kippers and toast, smoked salmon and eggs, and Eggs Benedict. A selection of cereals, breads, and cold cuts are also available on the buffet spread. We made a lunch reservation at Wernher Restaurant too! A Sunday three-course meal for £39.50 at a restaurant that looks so much like a French chateau from a history book is quite an understatement. This time we dressed appropriately (I went for a Rachel Zane pencil skirt in honour of the Duchess) and sat at a table by the window. By this time you would’ve thought we were over this hotel’s interiors, but no, it was still the topic of conversation. When food arrived, the conversation quickly shifted too. Dexter had the chicken and rabbit terrine for starters while I ordered the chestnut velouté. And of course, any given Sunday in England calls for a proper Sunday Roast and on the menu was roast sirloin of British beef with Yorkshire pudding, roast potatoes, carrots, parsnips, and braised red cabbage. We love Sunday Roast and this one certainly didn’t disappoint. Food and service is excellent. Dexter avoids carrots but this time he even wanted mine. (Revenge for last night’s pork belly?) Lunching like a royal meant our plates were served hot with a domed cover, then removed simultaneously, something I only see in the movies, so that was really brilliant. Like can-you-do-that-again-so-I-can-post-it-on-Instagram kind of brilliant. Dessert came in a sweets trolley and everything looked divinely tempting! 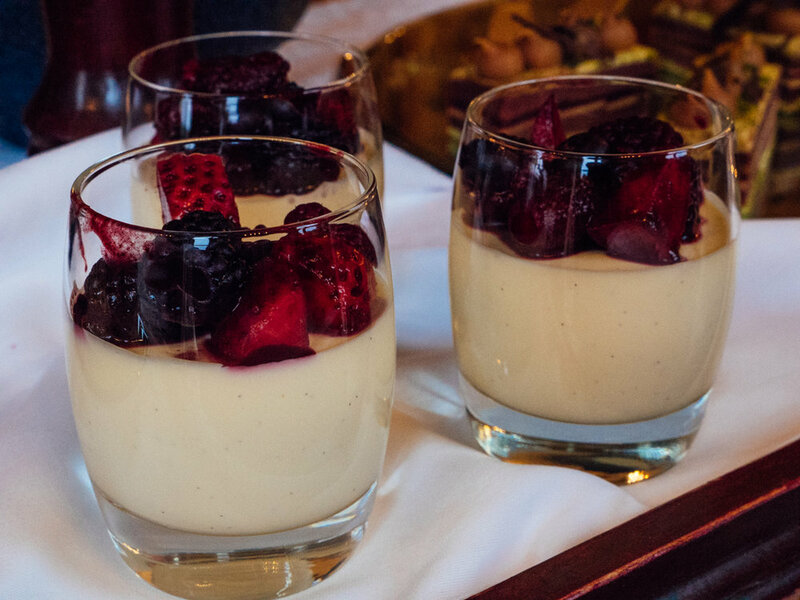 Do not miss dining at Wernher Restaurant especially if you’re already staying at Luton Hoo. And even if you aren’t staying at Luton Hoo, we’d say it’s worth it making a reservation here! It’s true that Luton Hoo is not a hotel, but a destination. The location is perfect especially for Londoners looking for a weekend escape or a spa break. Celebrating couples and honeymooners will ultimately enjoy Luton Hoo for its very character: it can be relaxed, it can be sporty, it can be romantic, it can be outdoors-y, but it will always, always be elegant. If English royalty has your interest piqued because of its history or by bingeing on The Crown, then the Luton Hoo experience is just for you. Interested in a booking a room? Click the link below!